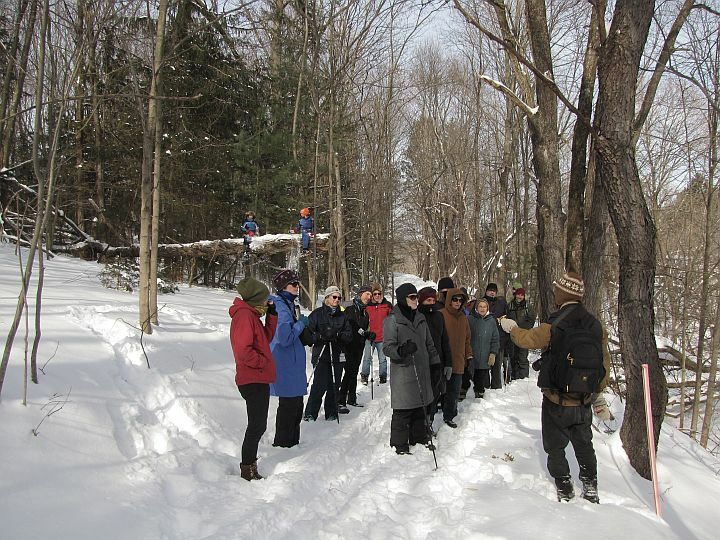 On Sunday, Feb. 9th, a group of 20 people spent a couple of hours with us exploring the winter botany and animal tracks along the recently opened section of the Harlem Valley Rail Trail in Hillsdale. 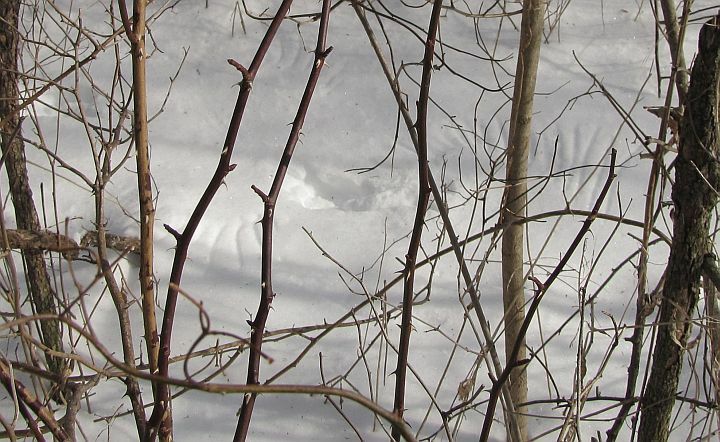 In this post, we will share some of our finds during this public “Winter Exploration”. We hope this serves as a nice review for the participants in the exploration, but also as a means for others to familiarize themselves with this public trail, aspects of its history, and some of the wild plants and animals now living there. We parked on the far side of the parking lot in front of Herrington’s main store (take White Hill Lane off Route 23 just west of the IGA supermarket) and found the trail head at the end of Anthony Road. We walked the first section of the trail heading southeast (see aerial photos below; if you still have trouble finding the trailhead, please feel free to contact us at fep@hawthornevalleyfarm.org). The old harness shop (?) just north of the site of the former Hillsdale train station. The history of the Harlem Valley rail line (whose bed now forms the Rail Trail) is long and rich. Starting in NYC in 1833, it was one of our earliest railroads. Apparently, the track north along the eastern margin of the State was approved as being the most economical path northwards and received impetus from NYC fears that the Boston/Albany connection would usurp NYC trade. The route reached Chatham by 1852. However, by that time, river towns, fretting over their loss of status, had a apparently banded together to support the construction of the rail line along the eastern bank of the Hudson. That competing line reached Columbia County at around the same time and, eventually, robbed the Harlem Line of its business. The line closed, despite public outcry, in 1972 . There’s much more interesting detail available; see, for example, this site and this one. For our purposes, the most relevant aspect is perhaps the economic importance of the line during the late 19th and early 20th centuries. This importance is nicely illustrated by the following two images. The first is a fire insurance map showing the area around the Hillsdale station in 1912; the second is an aerial view of the same area on a snowy February day in 1944 (not so unlike the day of our walk). 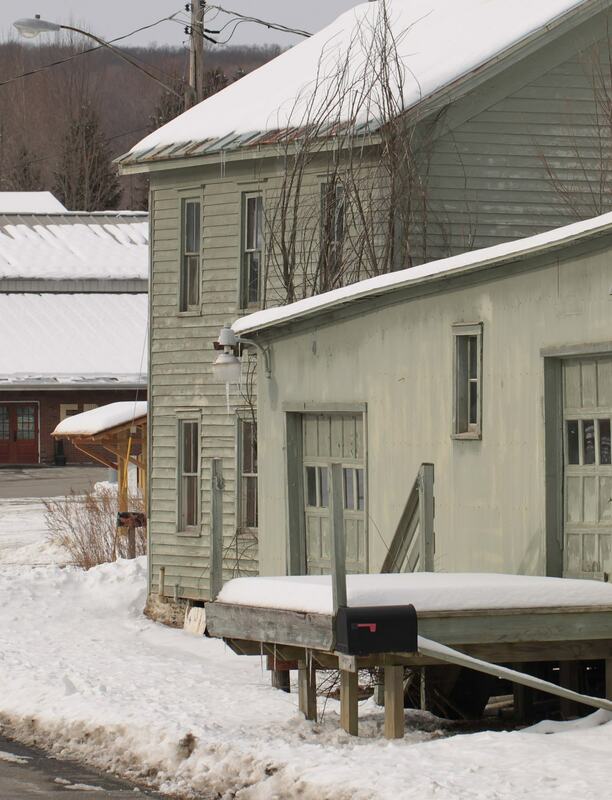 Look at the cluster of buildings around the rails: aside from the passenger station and nearby rail-side hotel (perhaps bespeaking City tourists), a milk depot (on the left, connected to its adjacent ice pond by a ramp for ice transport), a general store, a foundry and plow company, a feed store, and a lumber yard all shared the space. The daily milk train to New York City, from this and other stops along the line, was important for the development of dairy farms, and hence the landscape, in this region. While many of these buildings are now gone; some are not. A few minutes spent reflecting on the parking lot’s former heyday might be a nice way to start or end your walk. 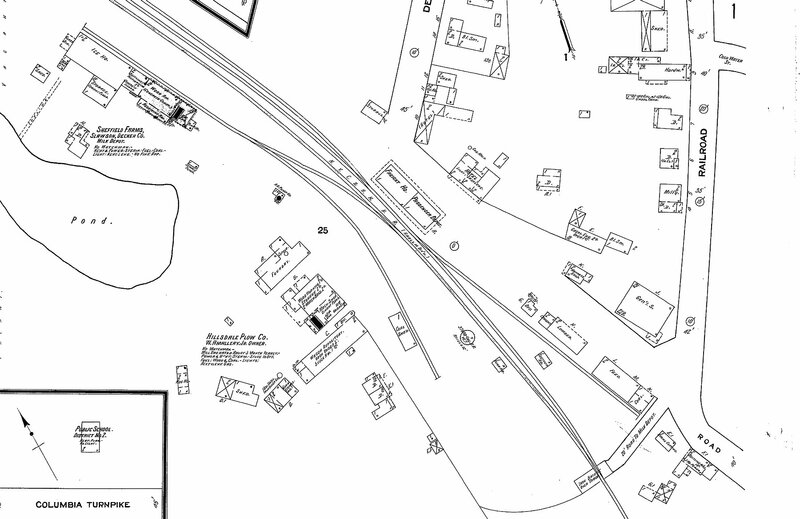 A 1912 Sanborn fire insurance map of the area around the Hillsdale station. The Hillsdale station area on a snowy February day in 1944; not much had changed since 1912. Enough railroad history, on into nature! 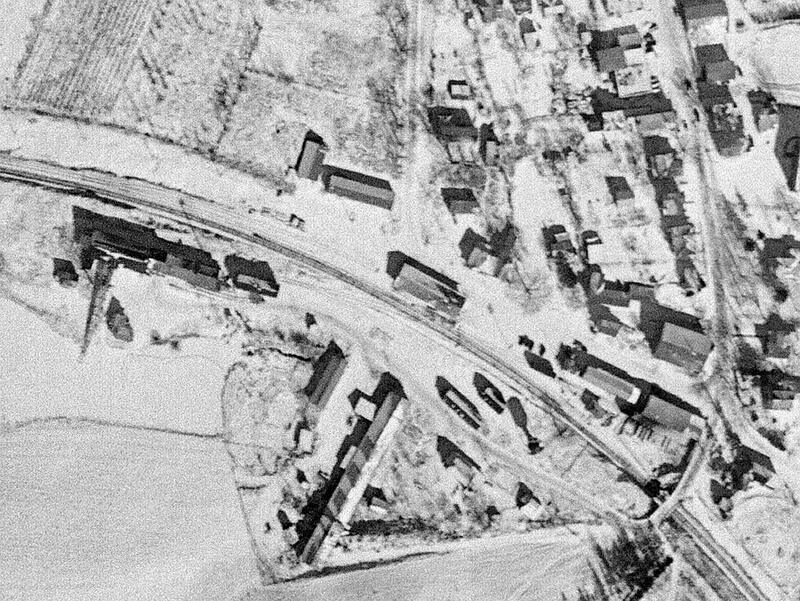 The following pair of aerial photos nicely illustrates the changes in land use history in the area now traversed by the Rail Trail. 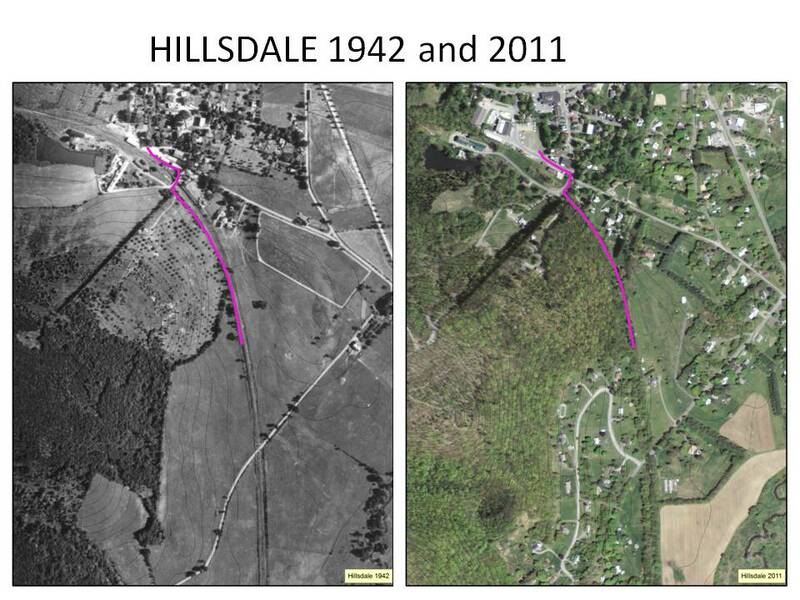 Comparison of a historical and current aerial photo of Hillsdale. 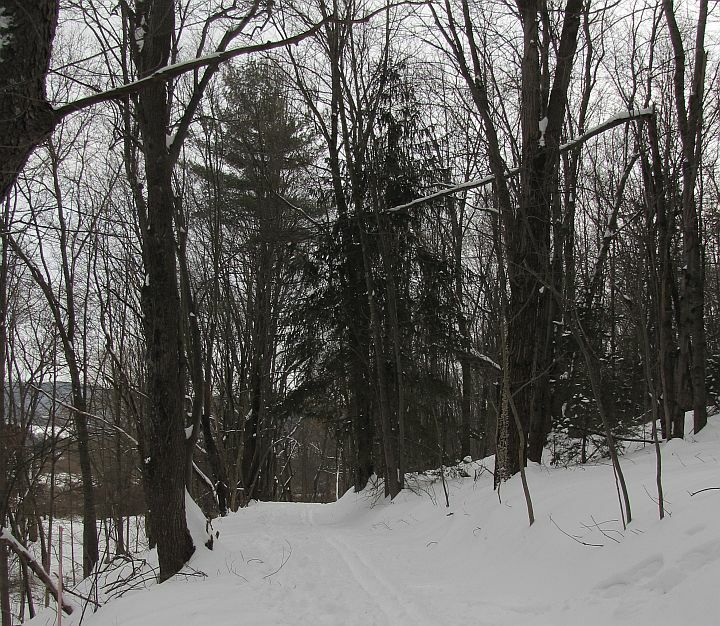 The section of the Rail Trail walked during this Winter Exploration is marked in pink. We familiarized ourselves with the most common trees growing along the trail. The abundant conifers along the first section of the trail are Norway Spruce. Next to the Norway Spruce, we also saw one big Pignut Hickory, lots of Black Cherry, some Sugar Maple, Red Maple, Boxelder, American Elm, White Ash, Trembling Aspen, Serviceberry, and a few Red and White Oak. 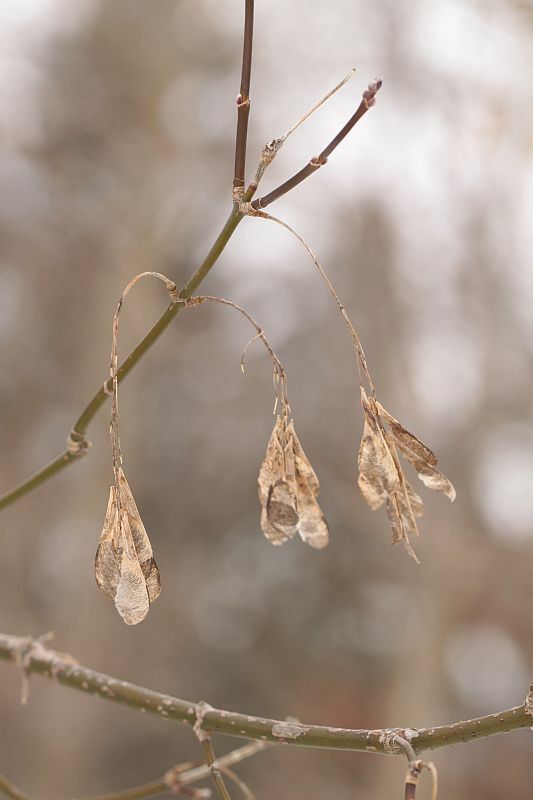 At the bottom of this post, we compiled some internet references that might be helpful if you are trying to remember the winter botany characteristics of these species, or if you just would like to see some images of a certain plant species during the growing season. Black Cherry trunk (dark bark) and a big Oriental Bittersweet vine (on the right). Black Cherry is a tree native in North America and tends to be present in forests with a recent disturbance history. Its seedlings and young trees need a lot of light and cannot grow under a dense canopy. Furthermore, there seems to be a soil pathogen native to this continent, which limits the density of Black Cherry at any one site. Interestingly, Black Cherry was introduced to Europe and has become an invasive species in the forests of England, where the pathogen is absent (or less virulent); this enables Black Cherry to grow in dense stands. For more details, see this paper. Black Knot Rust on Cherry branches. Native and domestic cherries, as well as plums, are susceptible to Black Knot, which forms unsightly black woody blobs on their branches. Although not beneficial to the tree, this fungus can be a valuable help in the winter identification of woody plants, because it is exclusive to cherries and their relatives. Along the Rail Trail, in addition to the very common Black Cherry trees, we also saw shrubs of Choke Cherry, and a couple of domestic Cherry trees. Scrapped twigs of cherries also have a characteristic bitter smell. Oriental Bittersweet, an invasive woody climber is common along the Rail Trail. However, these berries belong to Oriental Bittersweet, which is a high-climbing woody vine that covers many tree crowns along the Rail Trail with its twining branches. Its big stems can actually strangle trees by growing around the tree trunk, thus inhibiting its lateral expansion and the growth of new vascular (water-transporting) tissue. Oriental Bittersweet fruits in late winter. The now-common invasive Oriental Bittersweet is quite similar to the much rarer native American Bittersweet, and word has it that the two species hybridize! However, the fact that the fruits are growing in small clusters (up to three fruits) in leaf axils, are located all along the branches, and contain 5 or 6 seeds each, makes us think that this is definitely an Oriental Bittersweet. American Bittersweet would have a larger, single cluster of fruits at the tip of the branch and only 1 seed per fruit. American Bittersweet also does not seem to grow as big and tall as Oriental Bittersweet. 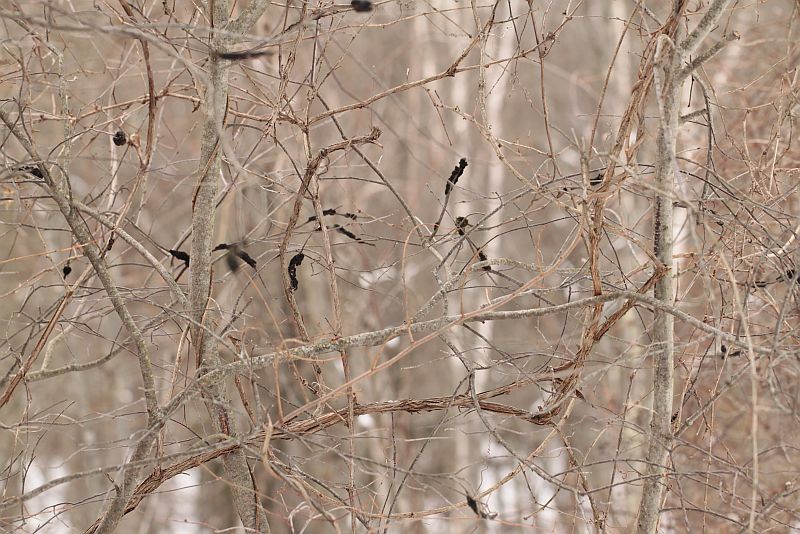 If you ever suspect of seeing an American Bittersweet growing wild somewhere in Columbia County, NY, PLEASE do let us know – we’d love to go and check it out! Japanese Barberry is another invasive species growing in abundance along the Rail Trail. 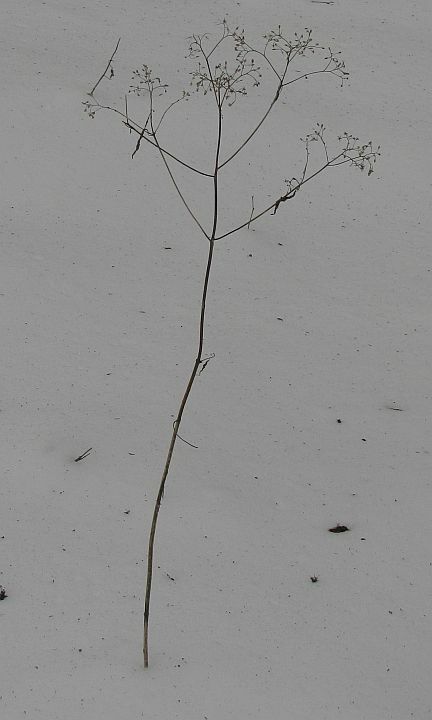 The prickly shrub sticking out of the snow is Japanese Barberry, another very invasive species in our forests. Japanese Barberry were preceded in our landscape by European Barberry, which was introduced by early colonists. However, it was later found to harbor a wheat disease, and efforts were made to eradicate it. Japanese Barberry was presented as an alternative with less impact on grain growing. More recently however, ecologists have found correlations between the occurrence of Japanese Barberry and Lyme Disease. Apparently, Japanese Barberry creates a welcoming habitat for both the disease-bearing ticks and the mice who host those ticks. For more on this link, see this web page. Japanese Barberry fruits are eaten by birds who disperse them to new sites. 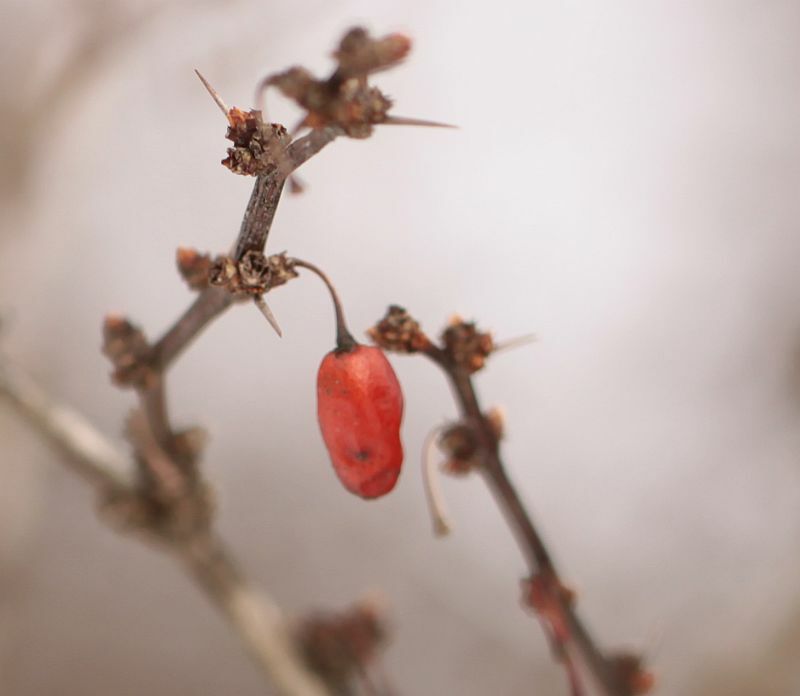 Japanese Barberry is easily distinguished from our other prickly invasive, the Multiflora Rose, by its oval fruits which grow singly or in pairs in the leaf axils, and by its stiff branches. Multiflora Rose has round fruits growing in clusters and flexible, arching, sometimes even climbing branches. 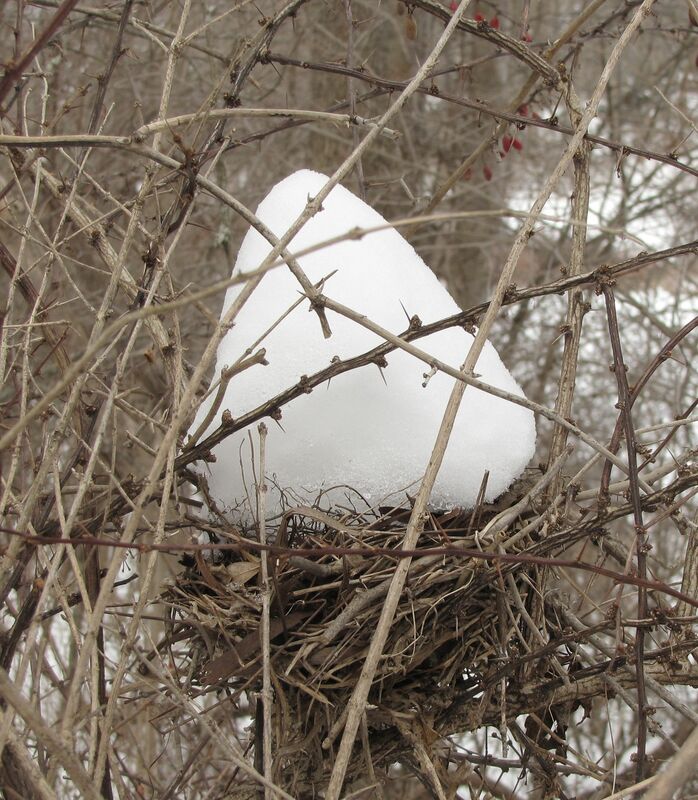 A bird nest in a well-protected location. Birds love to build their nests in spiny bushes, and many birds eat the fruits of Multiflora Rose, Japanese Barberry, Oriental Bittersweet and other invasive species, thereby dispersing their seeds to new locations. During our walk, we found somebody else who had made a temporary home in a Japanese Barberry bush. 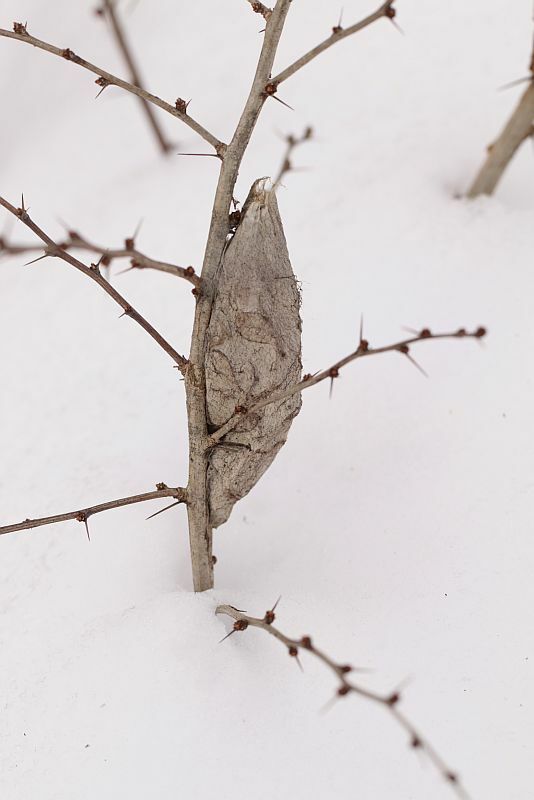 The cocoon of a Cecropia Moth is attached to a Japanese Barberry branch. This is most likely the cocoon of a Cecropia Moth, one of our largest native moths. Apparently, it used to be more common, but is now relatively around here. There are several suspected reasons for its decline, including pesticide use in forests and agricultural crops, and also the introduction of biological control agents who were supposed to attack the harmful introduced Gypsy Moths, but might also attack native moth species. Whether this caterpillar simply found the Japanese Barberry to be a good ‘hang out’ or also used it as food is not completely clear; while Japanese Barberry is not reported as a caterpillar food plant, European Barberry is. Wing tracks left in the snow probably by an owl that snatched a small mammal from the surface of the snow. Fruit of American Hazel, a native, wild-growing hazelnut shrub. We have two native species of hazelnut in the County: the American Hazel, pictured here, and the Beaked Hazel, whose nuts are enclosed in a calyx with a prominent “beak”. Although resistant to Eastern Filbert Blight, the bane of Hazelnut producers on the East (and now West) Coast, this species is not a big nut producer and so most growers have planted European Hazel. Another surprise for many in our group was to learn that our most common dogwood species in the County is not the well-known Flowering Dogwood tree, which actually is quite uncommon in the wild around here, but a shrub, the Gray-twig Dogwood, which grows profusely in many disturbed areas, including old fields and the side of the Rail Trail. 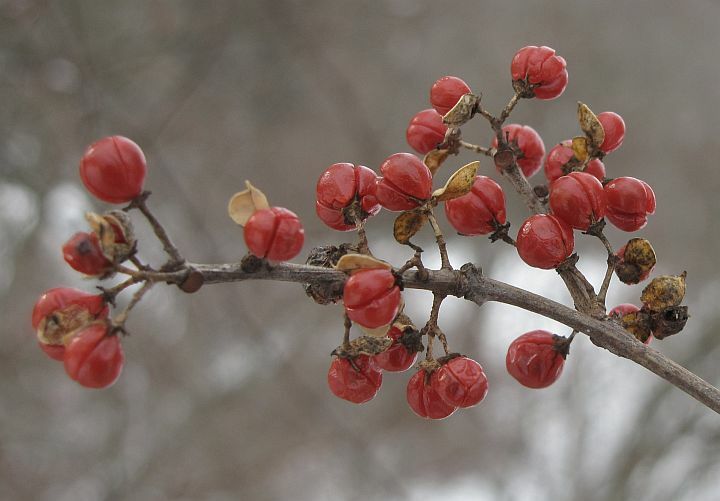 In the fall, the flower stalks are bright red and topped by little white berries, which are quickly eaten by birds. During our scouting, we also saw Silky Dogwood farther down the trail. Near the trail head, we observed one example of Alternate-leaved Dogwood, which is an exception amongst the otherwise strictly opposite-leaved dogwoods. 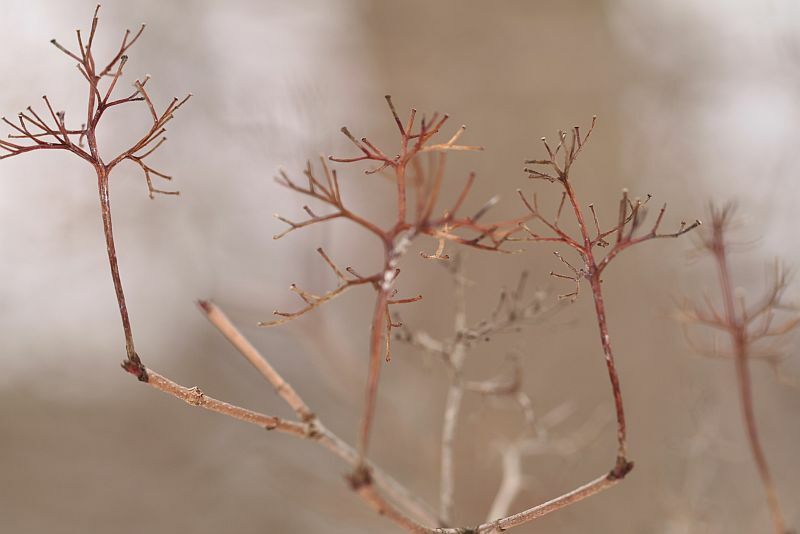 The empty flower stalks of Gray-twig Dogwood. One of the more common trees along the Rail Trail is the so-called Boxelder, which is botanically classified as a maple. It shares with all other maples the opposite branching pattern and the typically shaped winged fruit. However, when you come back in the summer, you will see that Boxelder has pinnate leaves, like Elderberry. 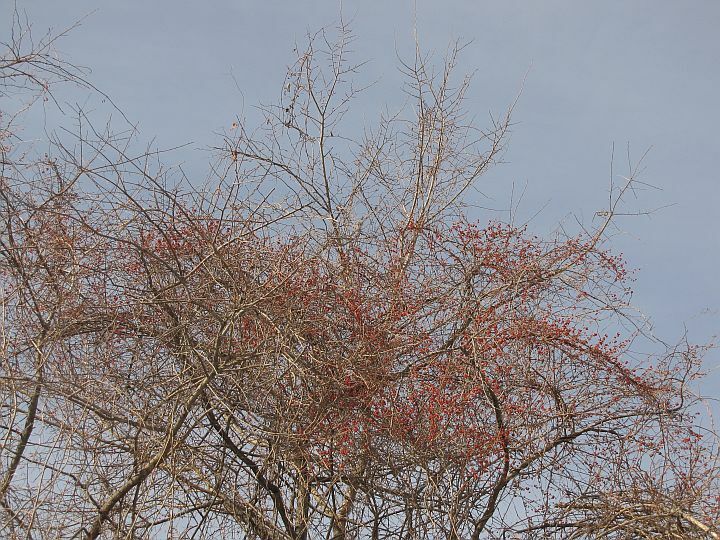 When you come back in the spring, look out for two different kinds of flowers growing on different Boxelder trees: male trees have only pollen flowers, while the female trees have seed flowers. 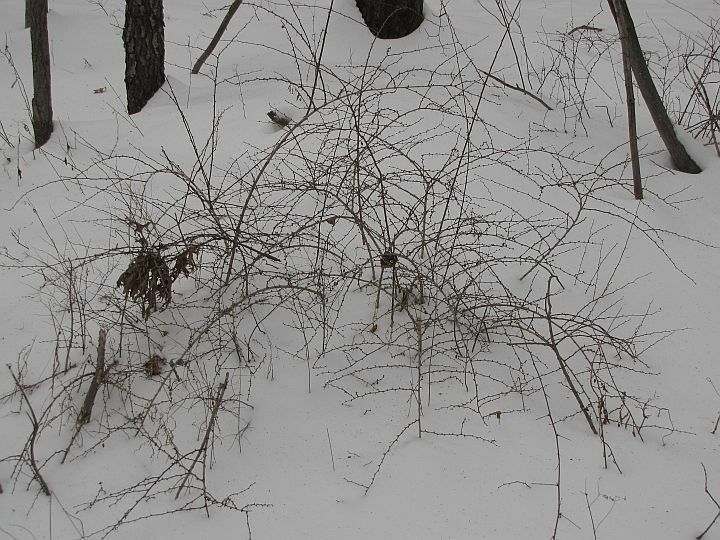 The remains of a profuse climber still cling to many trees and shrubs along the Rail Trail. Wild Cucumber, a native climber grows profusely along the Rail Trail. 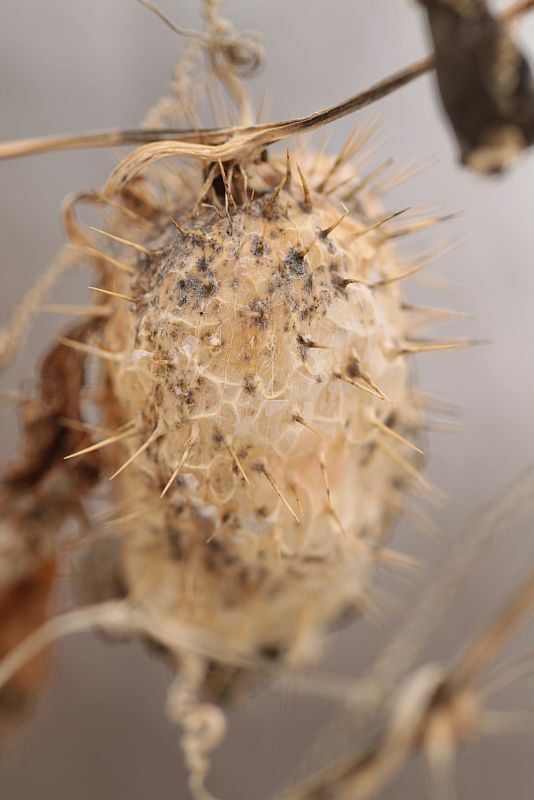 The peculiar-looking, spiny fruit give it away as the native Wild Cucumber. Come back in mid summer and admire the plentiful white star-shaped flowers of this attractive vine. 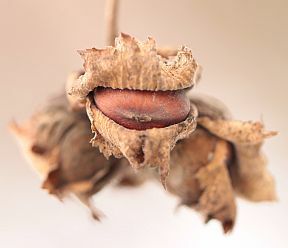 Several of the non-woody (herbaceous) plants are still sturdy enough to be clearly identifiable, even though their above-ground parts are totally dried up and dead, except of course, for the seeds that still cling to them and carry the life of the next generation inside. White Snakeroot is a native member of the aster family, which produces lots of tiny seeds, each equipped with a dandelion-like umbrella. This inconspicuous plant was the source of much grief from the colonial period through at least the 19th century, when it caused milk sickness (also referred to as “milk fever”) in people who drank the milk from cows that had eaten a lot of White Snakeroot. Other native herbaceous plants we saw along the trail included Wild Bergamot, Virginia Sticktight, Canada Goldenrod, and Smooth Goldenrod. We also had a look at the tiny hooked seeds of the introduced Japanese Hedge Parsley. Finally, on our way back towards the trail head, Conrad pointed out an oddly colored snag. It was probably a dead White Oak, and it was well-stained with a raspberry-like color. Initially, he thought this might be human work, but the stain wound its way at least 12′ or so up the trunk. After some research back home, we suspect this to be some extravagantly colored relative of the Blue Stain Fungus, but we’d appreciate hearing alternative or confirmatory comments. 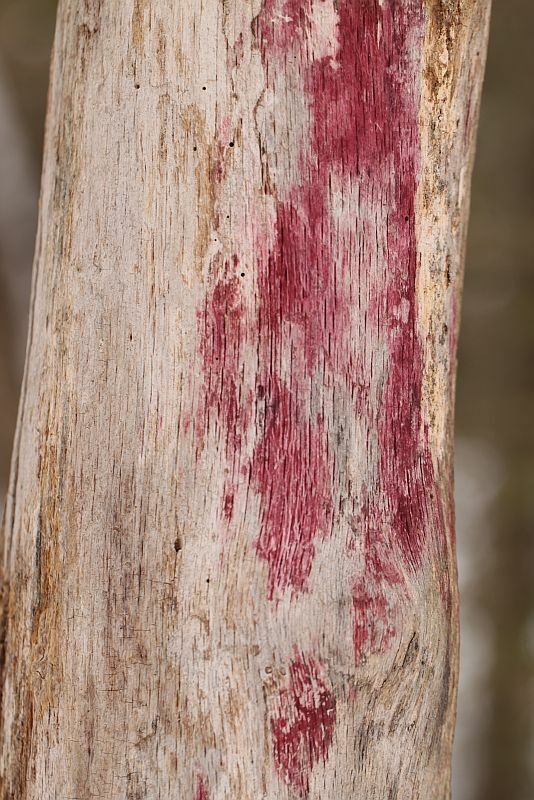 Mysterious pink stain on dead tree. 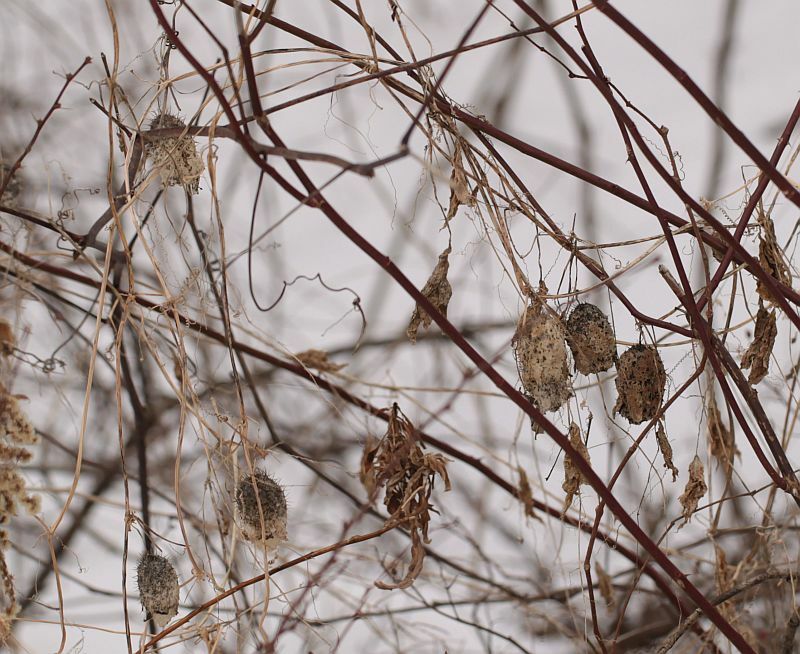 Conrad compiled a lot of bud images and other useful woody plant winter botany info and posted it here. If you would like to look up additional images of woody and non-woody plants throughout the seasons, I highly recommend using the New England’s Wildflower Society “Go Botany” web-site. They offer a number of images for each plant species in our region and you can trust their identifications. Just type the plant name into the “search” box and hit return.